Traumatic amputation is the accidental severing of some or all of a body part. Traumatic amputation most often affects limbs and appendages such as the arms, ears, feet, fingers, hands, legs, and nose. Amputations may be partial (some tissue connects the amputated part to the body) or complete (the amputated part is completely severed from the body). Trauma is the second leading cause of amputation in the United States. About 30,000 traumatic amputations occur in United States each year. Four of every five traumatic amputation victims are male, and most of them are between the ages of 15 and 30. Some of the more common causes of pediatric traumatic amputations are accidents with lawnmowers, automobiles, motorcycles, power tools, and farm equipment. Amputations may be caused by sharp objects such as knives or blades ("guillotine" amputation) or by heavy objects or mechanisms (crushing amputation). Crushing injuries are the more common cause of traumatic amputations. Blood loss may be massive or minimal, depending on the nature of the injury and the site of the amputation. Patients who lose little blood and have less severe injuries sometimes feel more pain than patients who bleed heavily and whose injuries are life-threatening. About 80 percent of all amputees over the age of four experience tingling, itching , numbness , or pain in the place where the amputated part used to be. About 30 percent of amputees experience a sensation of the amputated part "telescoping" or shrinking into the viable part of the limb. Phantom sensations may begin immediately after the amputation, or they may develop months or years later. They often occur after an injury to the site of the amputation. A partial or complete amputation is a medical emergency and as such, the affected child (and amputated body part, if possible) should be transported to an emergency center immediately. 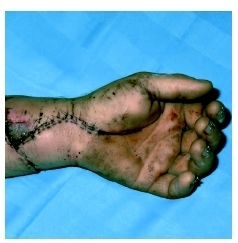 When the patient and the amputated part(s) reach the hospital, a physician will assess the probability that the severed tissue can be successfully reattached (called replantation). The Mangled Extremity Severity Score (MESS) is a diagnostic tool used to assess the probability of successful replantation and assigns numerical values to such factors as body temperature, circulation, numbness, paralysis, tissue health, and the patient's age and general health. The total score is doubled if blood supply to the amputated part has been absent or diminished for more than six hours. A general, emergency, or orthopedic surgeon makes the final determination about whether surgery should be performed to reattach the amputated part(s). The surgeon also considers the wishes and lifestyle of the child and parents. Additional concerns are how and to what extent the amputation will affect the child's quality of life and ability to perform everyday activities. First aid or emergency care given immediately after the amputation has a critical impact on both the physicians' ability to salvage and reattach the severed part(s) and the patient's ability to regain feeling and function. Muscle tissue dies quickly, but a well-preserved part can be successfully reattached as much as 24 hours after the amputation occurs. Tissue that has not been preserved will not survive for more than six hours. Contact the nearest emergency services provider, clearly describe what has happened, and follow any instructions given. Make sure the victim can breathe; administer CPR if necessary. Control bleeding using direct pressure; minimize or avoid contact with blood and other body fluids. Patients should not be moved if back, head, leg, or neck injuries are suspected or if motion causes pain. If none is found by a trained professional, position the victim flat, with the feet raised 12 inches above the surface. Cover the victim with a coat or blanket to prevent shock. The injured site should be cleansed with a sterile solution and wrapped in a clean towel or other thick material that will protect the wound from further injury. Tissue that is still attached to the body should not be forced back into place. If it cannot be gently replaced, it should be held in its normal position and supported until additional care is available. Saving the patient's life is always more important than recovering the amputated part(s). Transporting the patient to a hospital or emergency center should never be delayed until missing pieces are located. No amputated body part is too small to be salvaged. Debris or other contaminating material should be removed, but the tissue should not be allowed to get wet. An amputated body part should be wrapped in bandages, towels, or other clean, protective material and sealed in a plastic bag. Placing the sealed bag in a cooler or in a container that is inside a second container filled with cold water or ice will help prevent tissue deterioration. This man's hand was surgically reattached following a traumatic amputation. and physical therapy have all been used to treat post-amputation and phantom pain. Proper nutrition is essential to optimize healing after an amputation or reattachment surgery. A well-balanced diet rich in vitamins and with adequate caloric value is recommended to promote healing. Improved medical and surgical care and rehabilitation have improved the long-term outlook for such patients. Children tend to heal faster than adults and adapt more quickly to disability. The best way to prevent traumatic amputation is to observe precautions such as using seat belts and obeying speed limits and other traffic regulations. It is important to take special precautions when using potentially dangerous equipment and make sure machinery is turned off and disconnected before attempting to service or repair it. Appropriate protective clothing should be worn at all times. Children should be closely monitored when in the vicinity of lawnmowers, power tools, farm equipment, or other machinery that can cause serious injury. Parents of child amputees are faced with difficult decisions such as whether to get a limb prosthesis for their child and how to handle issues with negative body image. Parents will be encouraged to work with their child's rehabilitation team, which may include physicians, prosthetists, physical therapists, occupational therapists, psychologists, and/or teachers, to help the child adjust to the traumatic loss of a limb. Tools such as amputee dolls may be helpful in explaining how a prosthetic limb will be worn and to encourage positive body image. Phantom pain —Pain, tingling, itching, or numbness in the place where the amputated part used to be. Pulmonary embolism —Blockage of an artery in the lungs by foreign matter such as fat, tumor tissue, or a clot originating from a vein. A pulmonary embolism can be a very serious, and in some cases fatal, condition. Dalsey, William C., and Jeffrey Luk. "Management of Amputations." In Clinical Procedures in Emergency Medicine , 4th ed. Edited by James R. Roberts and Jerris R. Hedges. Philadelphia: Saunders, 2004. Flor, Herta. "Phantom-limb Pain: Characteristics, Causes, and Treatment." The Lancet Neurology 1, no. 3 (July 2002): 182–9. Amputee Coalition of America. PO Box 2528, Knoxville, TN 37901–2528. Web site: http://www.amputee-coalition.org. National Amputation Foundation. 40 Church St., Malverne, NY 11565. Web site: http://www.nationalamputation.org. Koman, L. Andrew. "Replantation." eMedicine , December 3, 2002. Available online at http://www.emedicine.com/orthoped/topic284.htm (accessed January 17, 2005).